DOCTOR WHO: Titan Comics – Tenth Doctor #10 Review | Warped Factor - Words in the Key of Geek. Heed the echoes, says Tony Fyler. 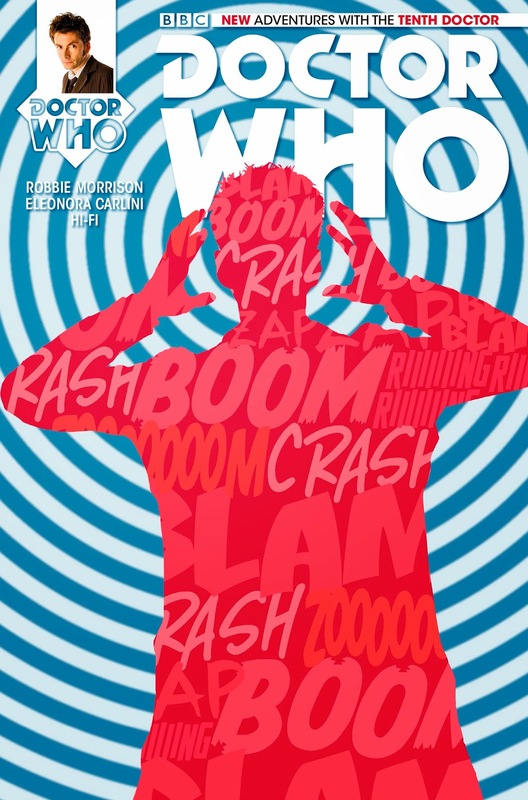 Issue #10 of The Tenth Doctor stories from Titan Comics is a straightforward one-shot story – Echo. It has parallels with Revolutions of Terror, the story that started Titan’s forays into Tennant territory, introduced us to Gabby Gonzalez, and dealt with invisible emotion-inspiring creatures. There are similar creatures here, and the Doctor and Gabby are back in New York to visit Gabby’s families after the harrowing events of Robbie Morrison’s Weeping Angels of Mons epic. Morrison’s still at the helm for this simpler, brighter story of (essentially) sonic whales and sonic whale-hunters. The problem in the story is an entirely accidental threat as the people of Earth are overcome by echo-song (like whalesong, only louder and even more likely to drive you absolutely spare. No, really). Turns out the echoes are in a right old panic because, oh look, here come the hunters with their sonic equivalent of Ahab’s lances, ready to kill the poor things. The Doctor and Gabby rig up a simple judo move, using the power of the whalers against them, and essentially acting like an intergalactic Greenpeace to save the sound-whales. That’s really about the size of this story – did we mention simple, straightforward one-shot? Tonally, it’s exactly right to shake the Etch-a-Sketch of Doctor Who and shake the grim tone of the Weeping Angels story off our minds and take us forward. 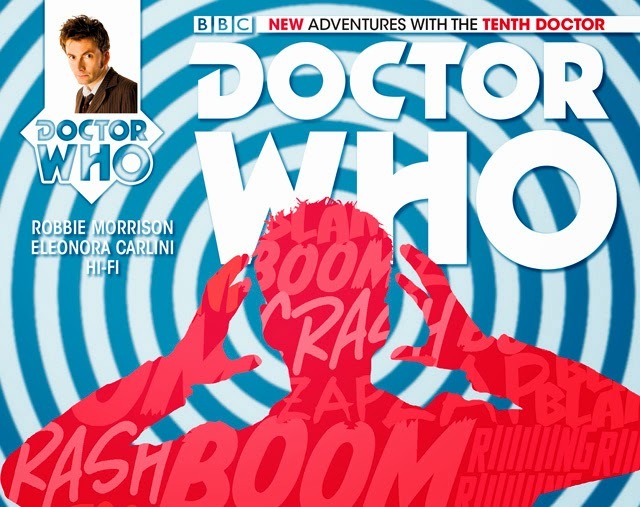 Morrison has a strong record across both Tenth and Twelfth Doctors, and this story, while it’ll be remembered as ‘the whale-hunting one’ still maintains the knack he has of tuning right into the appropriate Doctor and delivering a script which is lean while feeling expansive, crammed with banter while advancing the storyline or the emotion and mood of the piece with every panel. Artwork duties this time are fulfilled by Eleonora Carlini, and there’s a crispness and freshness to her work that brings the Tenth Doctor’s adventures to life in a way that’s the polar opposite of the First World War story. That was all muted muddy tones and creeping angels in shadows, which worked brilliantly for that story, but here Carlini delivers the bustle of modern day New York with a precision which helps take us there. She also delivers the main threat in this story in an ingenious, visual way – the sound effects of New York spinning out to hit us in the ears by the use of bright colours, discordant shapes and sound-words – the whumps and crunches and skrrrrrreeeeeks becoming dominant within the panels, so the presence of sound – rarely overemphasized as a general background component, here becomes invasive into the visual space, making its audio presence felt through the visual medium – brava, Eleonara, clever work. Carlini’s also one of the first artists in the range to deliver, in at least a solid handful of panels, a recognizable David Tennant face, rather than, as is often the way, as impressionist version of the Tenth Doctor. Overall, the art here is very appropriate to both the setting and the storyline, that crispness showing in sharp delineations of walls, things and people – and while Morrison’s Weeping Angels story was sheer brilliance, and its rendering in shadows and muddy colours was wholly appropriate to that setting, we’d be lying if we didn’t say that seeing the Tenth Doctor back in sharp lines and solidly-defined, beautifully colour-judged worlds wasn’t something of a relief after the angelic epic. Will you die of curiosity if you don’t pick issue #10 up? No, it’s in the nature of one-shot storylines to be comparatively non-essential. But you will miss out on this welcome opportunity to shake the dust of World War I from your brain, and get back to the hustle and bustle of a modern, colourful setting and a vibrant family dynamic with the Gonzalez clan. Plus of course, you’ll miss the chance to punch the air when the sonic avatars of modern whale-hunters get what’s coming to them, the reward for their short-sighted profiteering being in this case an unequivocal, unmourned extermination, lives taken as they would take lives. A little harsh, maybe, but true enough to the fundamental spirit of the Tenth Doctor that he stands up for those who ask for help, as these whale-avatars, the echoes, are able to do. Perhaps the best thing about the moral of this story is that it challenges us to be as good as the Doctor is – to put ourselves, our time, our money, our commitment, in the path of harm’s way to save the innocent, whether or not they’re able to ask for that help themselves. The Tenth Doctor #10 is released Wednesday May 13th. Check out an advance art preview here.